Hassan, K., and Tippner, J. (2019). "Acoustic properties assessment of neem (Azadirachta indica A. Juss.) wood from trees irrigated with secondarily treated wastewater," BioRes. 14(2), 2919-2930. The availability of traditional wood species used for musical instrument manufacturing has decreased in recent years. To overcome this problem, there is a need for alternative woods with acoustical properties similar to those traditionally used. This study investigated the acoustical properties of neem wood (Azadirachta indica A. Juss.) from trees irrigated with treated wastewater as a substitute for traditional wood and to indicate its suitability for musical instrument manufacturing. The results revealed a strong linear relationship between the dynamic modulus of elasticity (Ed) and shear modulus (G). Moreover, density (ρ) was a good predictor for both Ed and G. The findings showed that this wood has potential use in backs and ribs of stringed musical instruments. Comparison with traditional European wood species used for this purpose showed that this wood can be a successful alternative. Increased demand for water and diminishing availability of water resources have led to the use of treated wastewater in irrigation. Thus, extension of the cultivation of several tree species with close properties to traditional tonewood species under wastewater irrigation can play an important role in the future of the musical instrument industry. Azadirachta indica A. Juss. trees belong to the family Meliaceae and are commonly known as neem. This tree species has been used in traditional medicine and is widely planted in several regions of Africa and Asia (Kurimoto et al. 2014; Gupta et al. 2017). Neem trees can be used as windbreaks and roadside plantations for shade; their wood is durable and suitable for furniture (Hiwale 2015). In general, wood as a biological material is widely used in various parts of musical instruments such as violin and piano soundboards, xylophone bars, and bows for stringed instruments (Yano et al. 1992; Holz 1996; Alves et al. 2008; Brémaud 2012). Although several composite materials are now used successfully in musical instrument manufacturing, wood as a natural orthotropic material is still the best material and even used for the most critical parts of the musical instruments (Wegst 2006). The acoustic techniques of nondestructive testing can precisely predict several mechanical properties of wood (Ilic 2003; Horáček et al. 2012; Tippner et al. 2016). Resonance frequency techniques are among the acoustic methods that are frequently used to evaluate the viscoelastic properties of wood (Yano and Minato 1993; Brémaud 2012). The most important properties that determine choices among different wood species in manufacturing of musical instruments are mentioned in several reports (Ono and Norimoto 1983; Aizawa et al. 1998; Wegst 2006; Brancheriau et al. 2010; Baar et al. 2016); they include sound speed, damping properties, specific modulus of elasticity (Ed/ρ), and acoustic conversion efficiency (ACE). In addition, the availability of raw materials and their cost are also key factors in selecting wood for musical instrument manufacturing. In recent years, the availability of high-quality tonewood has decreased dramatically (Yano et al. 1997). Moreover, some wood species used in musical instruments are endangered species. For example, Acer pseudoplatanus is reported to be used for backs and ribs of stringed instruments, but shortages of this wood species in forests have led to finding another wood species with similar properties (Bucur 2006). Brazilian rosewood (Dalbergia nigra) is a suitable material for the frame boards of guitars, but availability of this wood is limited due to conservation of the tropical rain forest (Yano et al. 1997). Along with depletion of forest resources in the world, serious efforts have been started especially in arid and semi-arid zones of the world, and the importance of renewable natural resources has gained momentum in several countries. Governments of regions lacking forest resources started to use neglected areas such as deserts to establish man-made forests. Water availability for irrigation is another crucial issue that many countries face, especially those with rapid population growth. Therefore, these countries began using treated wastewater in irrigation to overcome this problem (Zalesny et al. 2011). For example, according to the Ministry of State for Environmental Affairs (MSEA) of Egypt, the government started to adopt these strategies through establishing forests irrigated with treated wastewater, as in the Egyptian-Chinese Friendship Forest in Monufia Governorate and many other forests in different governorates (MSEA 2008). Several efforts have been conducted in the field of musical acoustics to test several wood species to provide detailed information about their acoustical properties. This, of course, will help to find alternative wood species with similar properties to those woods traditionally used in musical instruments. The literature is very scarce on data concerning comprehensive acoustic properties of neem wood, and until now, there are no reports presenting acoustic characteristics of this wood species under an irrigation system with treated wastewater. Better understanding of neem wood properties will help to utilize this resource more efficiently. Therefore, this study was designed to comprehensively evaluate acoustic properties of A. indica wood from trees irrigated with treated wastewater and to study its feasibility for musical instrument manufacturing. Wood specimens with nominal dimensions of 500 mm (L) × 20 mm (R) × 10 mm (T), free from any visible defects, were prepared and selected randomly from Azadirachta indica trees (2017) grown in the Egyptian-Chinese Friendship Forest, Monufia Governorate, Egypt. The trees were irrigated with secondarily treated wastewater; the trees were 18 years old, and their average diameter was 30 cm at breast height level (1.3 m above ground level). The acoustic and strength properties of wood are altered by changes in moisture content of wood specimens. Therefore, the wood specimens were kept in an environmental chamber at 20 °C and 70% relative humidity (RH) for a sufficient period before testing until reaching a stabilized moisture content of 13%. All tests were performed under the same conditions. where Ed is the flexural vibration modulus of elasticity, ρ is wood density, L is the sample length, f1 is the flexural vibration frequency of the first mode of vibration, m1 is constant (m1 = 4.730), and h is the sample height. Samples were placed on two rubber supports at the nodal points of the first bending mode of vibration. Vibration was induced using a rubber hammer; the signals were collected and then analyzed using a fast Fourier transform (FFT) analyzer. where G is the dynamic modulus of rigidity (or shear modulus of elasticity), fn is torsional vibration frequency, n is mode number, ρ is the density, L is the specimen length, Ip is the second moment of cross-sectional area, and Kt = 0.1416 bh3 (where b and h are cross-sectional dimensions). where L is the length of the specimen, and f is the fundamental vibration frequency in the longitudinal vibration. where R is the acoustic constant, ACE is the acoustic conversion efficiency, Ed is the dynamic modulus of elasticity, and ρ is the wood density. Descriptive statistics were used to describe measured properties. Correlation analysis was performed to determine the strengths of relationships tested in this study. The measured values of density (ρ), dynamic modulus of elasticity (Ed), dynamic modulus of rigidity (G), and specific modulus of elasticity (Ed/ρ) are presented in Table 1. The density values ranged from 629 kg·m-3 to 732 kg·m-3, with an average value of 672 kg·m-3. Generally, wood density is an essential factor to be determined, as it correlates with other strength and elastic properties (Kollman and Côté 1968). Moreover, density of wood has a major effect on its acoustic behavior, such as speed of sound (Hassan et al. 2013). According to Gore (2011), the density range from 550 kg·m-3 to 800 kg·m-3 is more suitable for backs of guitars. The Ed values ranged between 8400 N·mm-2 and 13400 N·mm-2, with an average value of 11294 N·mm-2. The static modulus of elasticity of neem wood reported in Hiwale (2015) was 6955 N·mm-2, which is lower than the measured value in this study. In a study performed by Venson et al. (2008) on 11-year-old roadside (Melia Azadirachta) trees, considered a close species in its properties with neem, they found that the modulus of elasticity mean value determined using a three-point bending test was 10260 N·mm-2. Commonly, it has been reported that the physical and mechanical properties are influenced by several factors such as environmental conditions, genetic aspects, and tree age (Shmulsky and Jones 2011). The shear modulus (G) mean value of the neem wood was 836 N·mm-2, with a range from 670 N·mm-2 to 940 N·mm-2. Shear modulus is a ratio of shear stress to shear strain and is an important determining parameter for materials used in construction. In this study, the Ed/G mean value was 13.47. The Ed/G value for soundboards needs to be high; the mean value reported herein was lower than the value obtained by Chui (1991) for white spruce (19.4 N·mm-2). In general, the value of Ed/G reported in this study indicates a low shear effect. Additionally, a high shear value is required in wood species used for fretboards Sproßmann et al. (2017). High Ed/G affects the radiated sound at high frequencies. For instance, spruce wood has a high value, and this induces softness of the radiated sound at high frequencies (Yoshikawa and Walthan 2014). Figure 2 revealed an excellent positive relationship (r = 0.94) between Ed and G. Guan et al. (2016) found a strong relationship (R2 = 0.996) between in-plane shear and modulus of elasticity measured using a cantilever vibration test for six wood composites. The average value for the dynamic specific modulus of elasticity (Ed/ρ) was 16.8 N·mm-2·kg-1·m3. Figure 3 shows the dynamic modulus of elasticity (Ed) and G, plotted against the density values. The graph revealed strong correlations, with correlation coefficients of 0.92 (ρ and Ed) and 0.83 (ρ and G). Thus, ρ in this study was a good predictor for both Ed and G. In a study performed by Traoré et al. (2010) on Pterocarpus erinaceus Poir. growing in Mali, the correlation coefficient between density and dynamic elastic modulus was 0.77. Very little has been reported in the literature about the acoustical properties of neem wood. The acoustic properties of neem wood are presented in Table 2. The results showed low internal friction (tan δ), with an average value of 0.0079. The tan δ is an essential acoustical parameter that measures the amount of vibrational energy dissipated by internal friction (Wegst 2006). Generally, wood with low internal friction can vibrate for a longer time than those with high internal friction, after disengaging the vibrating source. Traditional wood species for high-quality soundboards usually have lower values than obtained for neem in this study; for instance, European spruce has a value of 0.0067 (Haines 1979). Several reports (Ono and Norimoto 1983; Ono and Norimoto 1984; Wegst 2006; Brémaud et al. 2011; Brémaud 2012) have mentioned specific Young’s modulus and internal friction as key parameters in wood species selection for utilization in musical instruments, and both are affected by the microfibril angle in the S2 cell wall layer. The other acoustical parameters, such as the acoustic constant (R) and acoustic conversion efficiency (ACE), are important to a comprehensive overview that enables relevant parties to use these materials more effectively and to find similar alternative materials. The acoustic constant (R) indicates damping due to sound radiation and relies on the ratio of the speed of sound to density (Kollman and Côté 1968). From the obtained results, the Rvalues ranged from 5.66 m4·kg-1·s-1 to 6.39 m4·kg-1·s-1, with an average value of 6.0775 m4·kg-1·s-1. The R value reported in literature for neem wood was 10.3 m4·kg-1·s-1 (Bucur 2016); this value is greater than the one reported in this study. Generally, low damping and high radiation are preferred for musical instruments, especially in the soundboard.. For example, Norway spruce (Picea abies) is a common wood species selected for soundboards with an R value of 13.4 m4·kg-1·s-1 (Spycher et al. 2008). The ACE is also an important value when selecting wood for musical instruments. The ACE, as shown in Eq. 7 combines both internal friction and the acoustic constant together. The mean value of ACE in this study was 780.2 m4·kg-1·s-1. In stringed instruments such as the violin, the ACE is related to the ratio of sound energy radiated from the instrument to the energy induced by the string (Yano and Minato 1993). Every musical instrument manufactured from wood requires specific mechano-acoustic properties. Some musical instruments require high density and elastic modulus. For example, woods used for xylophone bars generally have density values relatively close to 1 g·cm-3 (0.8 g·cm-3 to 0.95 g·cm-3) and dynamic elastic modulus values from 15000 N·mm-2 to 20000 N·mm-2 (Holz 1996). Woods used for soundboards require very low damping, high specific elastic modulus, and high shear modulus. Additionally, woods for fretboards require high shear modulus. Based on the presented results in this study, neem wood cannot compete with traditional woods used for soundboards, fretboards, or xylophone bars. To judge neem wood for its suitability in musical instrument manufacturing, the criteria introduced by Wegst (2006) were used. Accordingly, this wood species is more suitable for backs and ribs of stringed musical instruments. Additionally, plotting the transmission parameter (V / tan δ) against the anti-vibration parameter ρ/V, a criterion reported in Yoshikawa and Walthan (2014), confirmed the application of this wood species for frame boards. Thus, a comparison of the acoustical properties of neem wood with those of other traditional woods used for backs and ribs of stringed musical instruments was included in this study. Figure 4 shows the comparison of neem wood with those traditional woods used for stringed instruments manufacturing. It is obvious that neem wood properties were found to be close to the regression line introduced by Yoshikawa and Walthan (2014) for frame board species. Sitka spruce wood has a low ρ/V and a high transmission parameter. Those values lies far from the standard regression line for frame board woods. As a result, this wood species is preferred for soundboards, in contrast, the other plotted woods are suitable for frame boards. Table 3 presents the most frequent European woods used for backs and ribs of stringed instruments. Based on the experimental results, there are similarities in viscoelastic vibrational properties. * Calculated values; 1 and 2 denote data from Kúdela and Kunštár (2011) and Haines (1979), respectively. 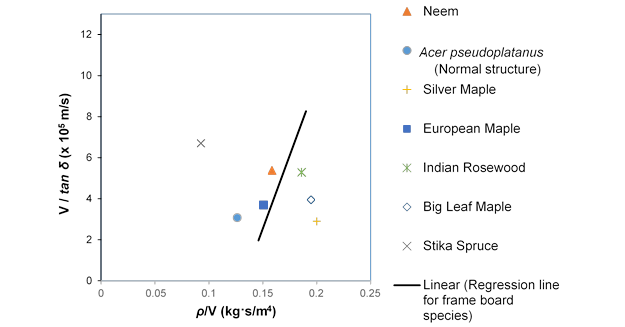 Neem wood has lower tan δ value than those for the three European species listed in Table 3. However, R is found to be higher than that of silver maple and lower than the values given for Acer pseudoplatanus and European Maple. Thus, neem wood in this study is still a good choice as an alternative species. Moreover, this wood can be used in instruments for educational purposes. According to Bucur (2016), there are five wood quality classes of (Acer pseudoplatanus), from poor to excellent, based on the acoustic constant (R) value. Compared to this wood, the neem wood R value reported herein was within the range of the moderate class (6 m4·kg-1·s-1 to 6.5 m4·kg-1·s-1). Of course, there are several methods presented in previous studies, such as chemical treatment or aging (Yano and Minato 1993; Obataya 2017). Those may be applied to improve acoustical performance of neem wood. Additionally, irrigation with treated wastewater may affect the extractive content. Likewise, there is a need to study the effects of extractives, for several researchers have indicated that extractives had significant effects on the acoustic properties of other wood species (Brémaud et al. 2012). Generally, irrigation with treated wastewater increases the nutrients and heavy metals in soil (Toze 2006), and this may affect the wood properties ultimately. High durability is preferred for woods used in musical instrument manufacturing. Neem is reported to be durable and easy to shape with machine tools (Hiwale 2015); this adds an important value to utilization in musical instrument manufacturing. Thus, neem wood from trees irrigated with treated wastewater can be used as an alternative species to the other traditional woods used for backs and ribs of musical instruments. Therefore, the expansion in cultivation of these types of trees with the exploitation of neglected land and treated sewage use will make an economic difference in the future of the musical instrument industry. The present study reported on determination of the main acoustic properties of Azadirachta indica A. Juss wood from trees irrigated with treated wastewater to identify its suitability in musical instrument manufacturing. The data yielded by this study provides convincing evidence that neem wood irrigated by secondarily treated wastewater is suitable for backs and ribs of stringed musical instruments and can be used as a good alternative to traditional European wood species, e.g., maple wood. As many countries adopt strategies toward the use of treated wastewater in irrigation, the need arises to investigate more wood species to find future alternatives for traditional woods used in this industry. The authors are grateful to the European Social Fund, the state budget of the Czech Republic, under the project titled “The Establishment of an International Research Team for the Development of New Wood-based Materials” (reg. No. CZ.1.07/2.3.00/20.0269). The authors would like to express their deep gratitude to Fatma M., M.Sc. (Department of Forestry and Wood Technology, Faculty of Agriculture, Alexandria University), who kindly assisted in the measurements. Many thanks to the staff at the sawmill (Faculty of Agriculture, Alexandria University) for sawing the logs and sample preparation. Aizawa, H., Obataya, E., Ono, T., and Norimoto, M. (1998). “Acoustic converting efficiency and anisotropic nature of wood,” Wood Research: Bulletin of the Wood Research Institute Kyoto University 85, 81-83. Haines, D. W. (1979). “On musical instrument wood,” Catgut Acoustical Society Newsletter 31(1), 23-32. Holz, D. (1996). “Acoustically important properties of xylophone-bar materials: Can tropical woods be replaced by European species?” Acta Acustica United with Acustica 82(6), 878-884. Horáček, P., Tippner, J., and Hassan, K. T. (2012). “Nondestructive evaluation of static bending properties of Scots pine wood using stress wave technique,” Wood Research 57(3), 359-366.
and Wood Technology 75, 12-18. Minstry of State for the Environmental Affairs (MSEA) (2008). Chapter 8: Green Belt and Woods, Annual Report 2007, Cairo, Egypt. Nakao, T., and Okano, T. (1987). “Evaluation of modulus of rigidity by dynamic plate shear testing,” Wood Fiber Sci. 19, 332-338. Venson, I., Guzmán, J. A. S., Talavera, F. J. F., and Richter, H. G. (2008). “Biological, physical and mechanical wood properties of paraíso (Melia azedarach) from a roadside planting at Huaxtla, Jalisco, Mexico,” Journal of Tropical Forest Science 20(1), 38-47. Yano, H., Matsuoka, I., and Mukudai, J. (1992). “Acoustic properties of wood for violins,” Mokuzai Gakkaishi 38(2), 122-127. Article submitted: December 3, 2018; Peer review completed: January 19, 2019; Revised version received and accepted: February 16, 2019; Published: February 20, 2019.